Chicago-area dealers are sending workers to William Rainey Harper College to earn two-year degrees in sales and retail management or baking and finance. 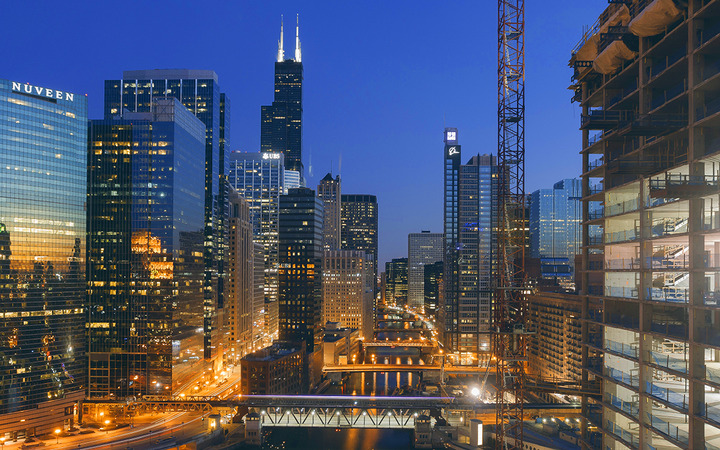 A two-year degree program hosted by William Rainey Harper College in Palatine, Ill., was designed to help Chicagoland dealers educate and maintain their most promising employees. At the tip of the spear is Phil Hellstrom, a former high school dropout and low-level dealership employee who turned his life and career around by going back to school. Auto Dealer Today caught up with Hellstrom to learn how the program evolved and why dealers are investing. ADT: Phil, how did you get into auto retail? Hellstrom: I got into it at 16 years old through a high school work program. I was a porter, starting at Schaumburg Hyundai, then M’lady Nissan, then jumped over to Schaumburg Honda. I didn’t graduate high school, so at 18, I went back to M’lady. I was a porter for about two months. It took me about two weeks to convince them to make me a salesman. The first deal I closed was for the job, and my “customer” was the GM, Larry Goldstein. But he first sent me to Grossinger Chevrolet in Palatine, where I had two trainers: Dave Glas and Brian Weinberg. I was there for about a month. I learned the basics, went back to M’lady, and started working full-time as a sales consultant. Hellstrom: I was pretty good. I was making money, surviving, having fun. For somebody with no high school degree, there weren’t many options. I was there for about three years, then left M’lady to go work at a “buy-here pay-here” location for another three years, on and off. And I did everything — selling, hiring, training, desking, dropping in GPS locators, auctions, licensing and titling. Then, one day, I was driving out to the Greater Rockford Auto Auction. And that’s when I had my epiphany. I thought, “I’m 24 years old. I’m grinding it out six days a week. There has got to be more to it than this.” I knew I had to get educated. That’s when I went for my GED, then got my associate’s degree from Harper College and my bachelor’s at DePaul University. ADT: Did you keep working? Hellstrom: I would work a Friday, a weekend, a month and a half when I’m not in school, all at M’lady Nissan. They were cool about it. They’d known me since I was 16. ADT: Did anyone tell you stop wasting time and sell more cars? Hellstrom: Some of them would say that jokingly, but they knew how serious I was. It’s a balancing act: human intelligences and animal diligences. The automotive industry doesn’t really encourage academics. I’m trying to bridge the gap between auto sales and academia. Hence me starting a business in automotive sales training. 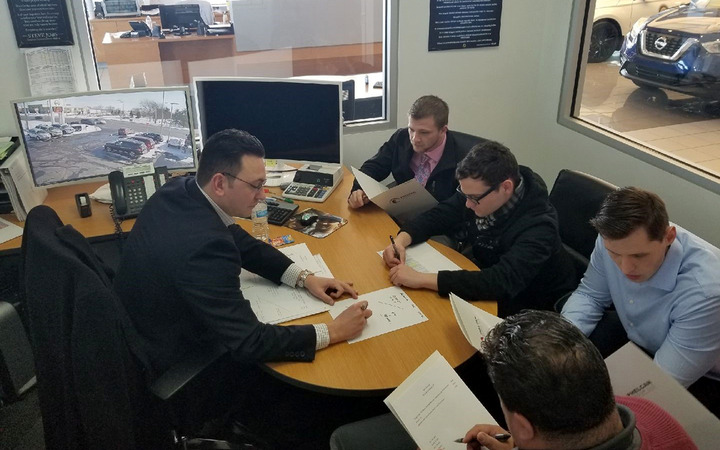 Phil Hellstrom (left), founder of Phelcan Group LLC and outreach specialist for Harper College’s auto industry academic program, meets with sales consultants at M’Lady Nissan in Crystal Lake, Ill., for a weekly sales training session. ADT: When did you start working on the curriculum that developed into the Phelcan Group/Harper College program? Hellstrom: It was about three years after I graduated from DePaul. I started the business in March 2017, but I had been gathering my thoughts, writing stuff down, talking with a lawyer and an accountant, creating a website and joining the local chamber of commerce. Then I started knocking on doors, drumming up business. So I became their outreach specialist, getting dealerships onboard. I’m the only automotive consulting company that works hand-in-hand with a community college. I know a lot of my competitors hand out little certificates. I’m talking about an accredited fully transferable degree that will never expire. Hellstrom: Yes, it’s an associate’s degree in sales and retail management or baking and finance. ADT: How many dealerships are you working with? Hellstrom: Six dealerships and a dealer group, and it’s not just cars. Whether you sell cars, motorcycles, box trucks, or anything else, you can send your workers to college. And all our students are full-time, sponsored by their dealership. That’s the only way into the program. ADT: So the appeal to the younger worker is you can continue working at the dealership, get an accredited college degree, and advance more quickly. Hellstrom: Yes, but you could be any age. If I’m the owner of a dealership, and I have someone I want to be a manager someday, but they don’t know the basics — the reading, writing, and math you need, the business ethics, micro- and macroeconomics — why not put him through the program? Hellstrom: It’s $7,500 per student per year for a two-year program. It’s $2,500 per semester or about $625 a month over the two years. ADT: How do your students balance work and school? Hellstrom: They’ll typically spend nine or 12 credit hours a week in school and 28 to 31 hours a week at the dealership, including all day Saturday. Hellstrom: I say that’s a fallacy. There’s a reason I’ve been working with M’lady Nissan since I was 16. They believe in me. I believe in them. Ninety-nine out of 100 businesses are not doing that. People are making lateral moves to climb the ladder. Give them a mentor, a purpose, show them the light at the end of the tunnel. And that’s what millennials want, a mission and a purpose. They can find that at the dealership. ADT: And they can make a lot of money. Hellstrom: They can. But I don’t think we’re attracting the millennial workforce the way we should. Dealership work, yes, it’s definitely a grind. It’s not for everybody. But our candidate pool is horrendous. Every dealership is scraping to find people. So it’s easy to have a conversation like this with dealers. Getting them to spend the money is another matter, but they have, and it’s already working. They are keeping their best and brightest and selling more cars quarter-to-quarter.